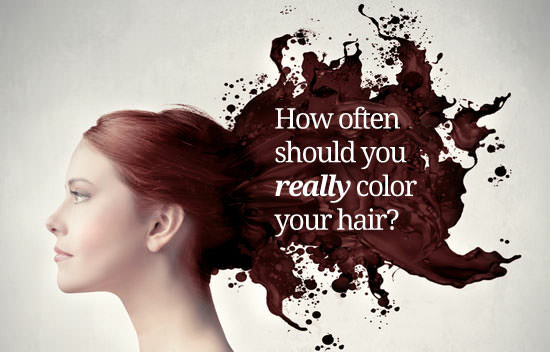 How Often Should You REALLY Color Your Hair? In a world of highlights and lowlights, it can be tough to know how often you should actually color your hair. Because both dye and bleach are potentially damaging, says celebrity hairstylist Julia Papworth, it’s important to learn “the rules.” Here, we break them down for you and offer a couple of quick pointers. Everyone’s time lapse between appointments is different, but according to David John, master stylist and colorist at Serge Normant at John Frieda Salon in NY, if you have a lot of gray hair and are dying it a dark hue, you’ll probably need to go in for a touch up about every three weeks. Only dye your hair one color as opposed to highlighting it? Then the suggested wait time by both colorist and manufacturer is approximately four weeks, says Kari Hill, master colorist at the Serge Normant at John Frieda Salon in LA. “By that time the color has faded and/or oxidized.” However, some clients choose to come in sooner (or hold off a bit longer) depending on how bad their roots are. Kari recommends getting them done together first, then four weeks later you should do your base color only, she advises. So basically, every four weeks touch up your base, and ever eight weeks do your base and highlight. Multi-tonal colors (highlights and lowlights) ensure a very natural look and will make your roots way less obvious as hair grows out, points out David. The process might be more expensive, he says, but hey, the good news is, it lasts twice as long! According to David, women with fine, straight hair need to get their color done more frequently than those with thick, curly hair whose texture disguises their roots. To help ease the damage of frequent coloring, heed these tips, courtesy of Julia. 1. If you have a one tone hair color, use permanent color on your roots. Permanent color often contains ammonia and can be more damaging, so refresh the rest of your hair with a semi permanent color to add shine. 2. If you are more of a bleach blonde gal, you can wait about six to eight weeks for a touch up, especially if your base is a lighter color naturally. When you do go in for a touch up, make sure your stylist never pulls the bleach down over previously lightened hair. This causes major damage and breakage. 3. Finally, to help push a few more days or weeks in between colorings, you can indulge in a color enhancing shampoo and conditioner like the Blonde Idol line by Redken.